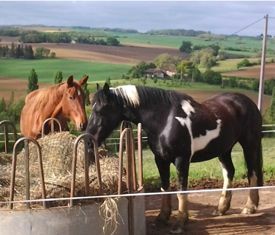 One and a half years ago we bought our 'dream dressage horses', two six month old fillies, Quaramba an Oldenburg by Quaterback and Djinnie a Hanoverian by Dancier (see the back-issue Introducing Djinnie and Quaramba). 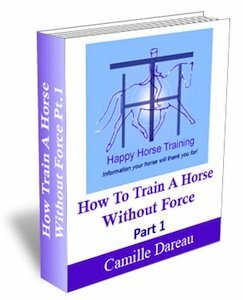 After a little while we integrated them into the big herd of horses living in their Paddock Paradise here at Happy Horse Training. We wanted them to live the stimulating and challenging life of a herd member, and they have certainly been doing that. Quaramba (left in the photo above) is the more delicate of the pair, and she had a period where she seemed to have one little injury after the other. 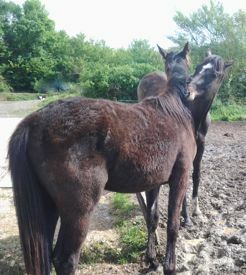 One time a swollen fetlock, then a thorn in her knee, but gradually over the summer and following winter she transformed into a tough and well co-ordinated youngster. Both fillies can gallop up and down muddy, slippery slopes or over sun hardened clay without difficulty, they can cope with rain, wind and heat with minimal rugging and shelter. Arguably the most important skill they have mastered is their social ability within their large and demanding family. In fact they have succeeded within the herd to the point that recently they played a key role in the integration of new herd members. 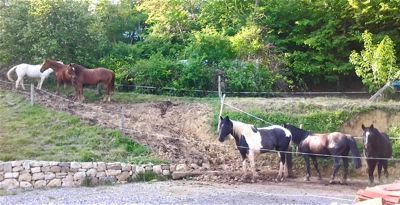 In the last few weeks we have made some changes to our two herds. We have one small herd which belongs to Rafael, a cryptorchid (he was incompletely castrated, giving him near stallion-levels of testosterone although he is infertile) who cannot be in the same herd as the geldings. The other herd is a mixture of mares and gelding, including Djinnie and Quaramba. We decided to move Uno and Totale, the two coloured youngsters (photo, left), full brother and sister, out of Rafael's group into the big herd, as we felt they were too socially restricted with only the three other horses to interact with. 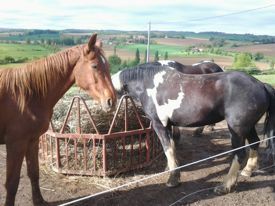 Uno, the gelding, has grown up in Rafael's band, so was accepted by him, but had little freedom to form friendships in his presence. At the same time as we moved those two to the big herd, we decided to take three mares out and put them in Rafael's band. 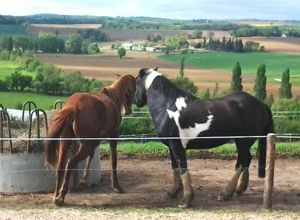 These three mares are good friends, but were the lowest ranking members of the big herd, and always kept a certain distance from the others. One of them is Octavia, a Lippizaner mare who we saved from being euthanized due to aggression towards both people and other horses (see Octavia's Story), and as her problems were possibly hormone-related we felt it would do her good to be part of a herd with a real 'stallion'. At the same time as we made this change over between the herds, we took on a horse for schooling livery who's owner was happy for us to integrate him with the big herd - something which we've found has a very positive influence on a visiting horse, but with which not many owners feel comfortable, due to the possibility of injury and so on. 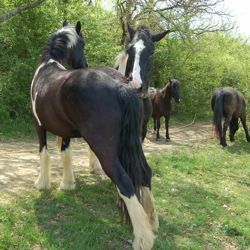 On his arrival, the visitor - a thoroughbred ex-eventer called Pacha - spent the night in a field beside one of the main herd's Paddock Paradise lanes, along with Uno and Totale from Rafael's herd, so that all three could meet the new herd before joining them. When we put put them together, Uno and Totale were at first only concerned with getting back to their old herd, and went round the lanes to find the closest point between the two territories. Waiting for them there on the other side was Amy, the mare who had been their surrogate mother in Rafael's band, and who was still very attached to them. Although it was sad in a way to split them up, we knew it for the long-term benefit of all three, and the fact that were free to go and see each other across the fence meant that it wasn't as traumatic a separation. For a few days the two youngsters spent most of their time near Amy, far from the other members of their new herd, but they came round to get their feeds with the others, and this was when we noticed that Quaramba seemed to have an instant attraction towards Totale, despite Totty's initial aggressive response to her advances. Totty is an extremely solidly-made Merens x Irish cob, and in the past we would have been very worried for Quaramba's delicate-seeming spider-legs faced with Totty's double-barrel kicking, and charging with teeth bared, but now we know that well-adjusted horses will rarely hurt each other badly, and of course the danger of injury is so much less without shoes. 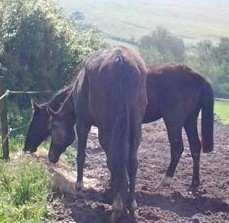 Quaramba had clearly fallen in love with Totale (despite both being mares!) and seemed to be actively trying to draw her into the herd. One day as we were working at the arena, we noticed Djinnie and Quaramba going round the lane to the water trough, which is in the same place where Totty and Uno were longing to get through to Amy in their old herd. A few minutes later Djinnie came back to the others in the main herd, but Quaramba was on a mission to bring Totty back round with her. With Uno following, all three did a fascinating dance round the lane - sometimes Quaramba leading Totty, and sometimes the youngsters turning around, wanting to go back to Amy. Amazingly Quaramba succeeded in bringing them both round to the main herd's eating area, where they got some hay. In the following days Totty and Uno spent more and more time with the new herd, with Totty becoming less and less defensive towards Quaramba. The beginnings of a strong friendship are clear. 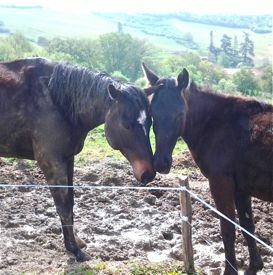 In the mean-time Djinnie (photo below, right), usually inseparable from Quaramba, had found a new love of her own: Pacha, the visiting Thoroughbred! Clearly disapproving of Quaramba's friendship with Totty, and not wanting to have anything to do with the two trolls (as we lovingly refer to Uno and Totty! ), she was spending her time smooching over her new handsome boyfriend, grooming him, eating with him and providing him with some much-needed comfort in his new surroundings. Despite her affections, she still made sure he respected the herd rules, gently preventing him from approaching the main hay feeders. We had already seen what a positive influence Djinnie and Quaramba were in integrating the herd before, and here they showed us again how valuable their outgoing, confident temperaments are to the herd as a whole. Seeing how rich their social interactions are, not to mention how tough they have become physically, it's hard to imagine what their lives would have been like if they had ended up like many sports horses, condemned to a life of confinement and solitude. For Djinnie and Quaramba's future training, there could be no better foundation than the profound contentment that their lifestyle gives them.